96 of your favorite songs sung by "Hi" Busse, Tom Chambers, Robert Meyer, Dan Meyer, Tom Spaulding, Bob Wagoner, Buck Page, John Ryberg, John Lamount, Tex Ritter, and Carson Robinson. Also includes old cowboy photographs, cowboy tidbits, Tumbleweed History, and more. 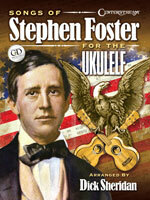 Stephen Foster, America�s first truly Rock Star. This choice selection of 17 Stephen Foster�s most famous and enduring songs is drawn from a repertoire of plantation melodies, minstrel songs, and parlor favorites. These great arrangements are truly fun to play. Melodies are in both standard notation and tablature. Large easy-to-read chord diagrams and symbols make for easy quick sight reading. A CD is included for song reference and accompaniment. The songs are arranged specifically for the ukulele, but suitable for all chord instruments, there are lyrics and commentaries for each song. Standard gCEA tuning for soprano, concert and tenor ukulele. This unique book celebrates the romance attached to the cowboy and his free-roaming lifestyle. 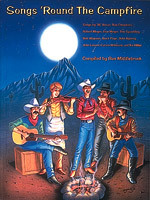 By combining classic cowboy songs, trivia, photos, articles and diagrams with the tunes of current cowboy songwriters, this book pays special tribute to our Western musical heritage. Relive the days of the cowboys bringing the herds home in this interesting compilation of facts and music! 53 songs by noted writers such as Doc Denning, Chris LeDoux, Rusty Richards, and Roy Rogers, Jr. celebrate the life and times on the range. This unique publication also features articles on black cowboys, cowgirls, cowboys' Spanish ancestry, and more. At the beginning of the 20th century, the tango was born in Buenos Aires, and it was a style that spread dramatically all over the world. Tango is a dance, a rhythm and a characteristic musical color. 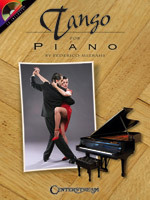 The 10 solos in this book were written especially for piano by award-winning composer Jorge Polanuer, and performed on the CD by Federico Mizrahi, one of the most popular pianists in Buenos Aires. Play along with the tangos, milangos and waltzes that are presented in different degrees of complexity.